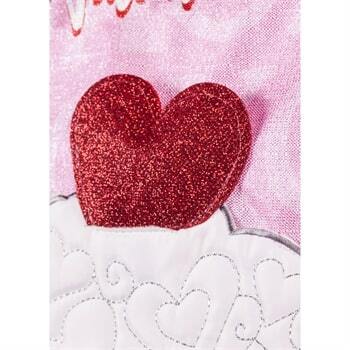 Shop our vast selection of Valentine's Day Garden Flags with decorative accents and bright festive colors. 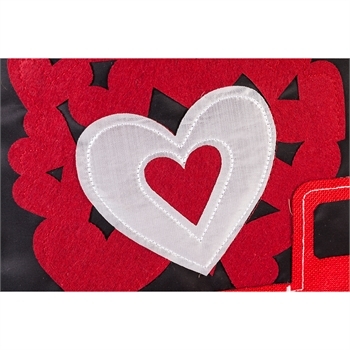 Happy Valentine's Day flags feature the newest designs with applique embroidery detail. Embellished with 3-dimensional accents to add eye-catching color. You'll find lacy Valentine hearts, hugs and kisses and adorable Valentine owls. We offer the highest quality Valentine flags. New outdoor fabrics include burlap and linen. These material are durable and allow for 3-D enhancements. You'll enjoy the 3-dimensional detail of applique flags and burlap flags. You'll find a variety of themes created by some of our nation's leading artists, including Victoria Hutto, Jennifer Brinley, Robin Rawlings and Elena Vladykina. Outdoor yard flags will enhance your Valentine's Day decorations.